Phase I Casework and Facade Installation. 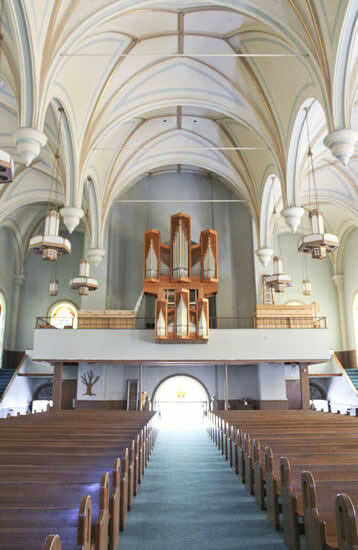 Our Fond du Lac project is an interesting combination of rebuilding a significant historic instrument, while integrating a sizable amount of new organ construction activity. 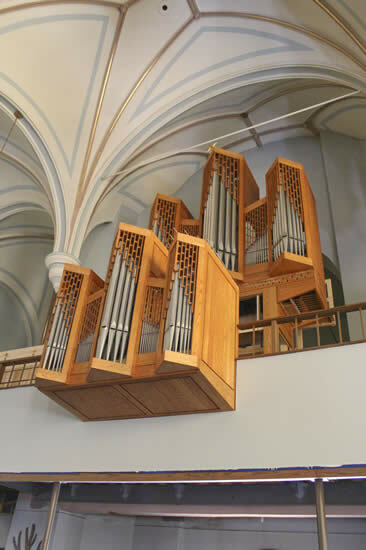 The nucleus of this instrument originated as a Casavant organ located at Trinity Episcopal Church, Mercer Street, Princeton, New Jersey. The original installation, at 42 stops, was the largest Brunzema era North American tracker instrument. While a sizable church instrument, its specification was dictated by the space available under an A-frame ceiling over a restricted balcony location. The new venue is a much larger decommissioned Catholic church. The acoustics of the room, with approximately five times the previous volume, is much more spacious and supportive of all, but especially low, frequencies. The taller ceiling and larger balcony allows the possibility of expanding previously restricted divisions. The original Great and (ruck)Positive divisions are classical in layout and location and are complete divisions tonally. They are being reinstalled largely unchanged. The Princeton location severely constricted the Swell and Pedal divisions, and this project has taken the opportunity to expand them. The project will be done in phases to meet the scheduling needs of the owner and builders. The first effort was to reinforce the balcony with new steel beams, and open and plaster the existing organ chamber to support the expanded organ design. Phase I, currently being installed in the church and encompassing about half of the total stops, will install the Great, Positive, and Solo divisions. The original organ had pneumatic stop action, limited combination pistons and levels, and four total manual and pedal couplers. A new console stack was built with expanded couplers, four to Pedal and three to Great, and a next generation combination action/sequencer with expanded number of pistons and Hall Effect technology. The larger balcony depth allowed placing the Great three feet farther from the Postive on the balcony rail to allow passage behind the organ bench and room for a separate organist and choral conductor. Additional height allowed the Great impost to be raised two feet. This permitted the fourth manual to be expanded with a small Echo division with louvers and hitch-down pedal in the brustwerk position containing a continuo flute, cornet, and treble reed. The Princeton Pedal had only principal and reed choruses, with the sixteen foot reed partially half length. The Pedal division will be expanded in two phases. Phase II will install the large wooden stops, a new 32 Bourdon and 16 Violone, around the perimeter of the existing, but now totally open, organ chamber. Phase III will install free-standing Pedal towers in the balcony, on both sides of the Great casework, with a new 16 Principal in the facade. This expanded Pedal will complete the division with an additional soft 16 reed, flute, and string stops. Phase IV finishes the organ with a new Swell division installed perpendicularly behind the Great division with swell shades on both sides of the box for increased dynamic range and projection. This expanded division will variously balance, contrast, and complete the sound of the Great division. Please contact Wahl Organbuilders for informed solutions with restored, rebuilt, and new organs to meet your specific requirements. read about the installation with pictures in the OHS Database.